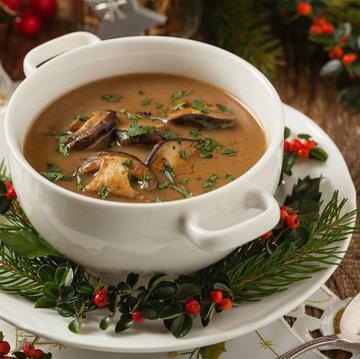 Give the most luxurious food gift available, a Soup of the Month Club from Send a Meal. Your gift recipient will receive a beautiful specially prepared certificate and a list of every meal they can look forward to receiving. Each month's soups serves two or four people, and most meals can be easily split to serve two to last throughout the entire month. Simply place the remaining easy to use packaging in your freezer and heat the remaining portions when your ready to eat them! Join the Soup of the Month Club and each month you'll receive a gourmet soup. Each soup gift will be delivered during the 3rd to 4th week of each month according to length your meal plan. Order this monthly meal plan now to receive FREE SHIPPING every month! Give the perfect hassle free gift that keeps on giving! The Soupl of the Month Club is the perfect gift for just about anyone! This beef stew features tomatoes, red wine and Mirepoix to flavor and enrich the gravy. The beef is mouth-wateringly tender, the sauce rich and flavorful. Prepare your tastebuds for this unique combination of fresh, flavorful California vegetables. Our Broccoli, Mushroom and Zucchini Soup was made by accident, but now we have an instant classic ready to deliver to your door for guaranteed enjoyment. This exotic soup is made with Fresh broccoli, mushrooms, zucchini, vegetable base, gourmet parmesan cheese, black pepper, salt, and saffron. Impress your guests, and forget the mess with our Broccoli, Mushroom and Zucchini Soup! With lots of vegetables and moist chicken thigh meat, this is a must as a winter staple. Send it to a sick friend, take it for lunch, or have a simple dinner with this and one of our gourmet flatbreads. This flavorful and zesty rich soup will leave your mouth watering for more. Every spoonful is full of the rich color of beans and other fine ingredients. Taste it and know why people rave about this great soup starter. This isn't your simple tomato soup. Italian spices, a hint of milk (lower fat than cream), and a little thickener make this bisque a meal! Nothing better on a rainy day. Lots of vegetables, rich beef broth, loaded with beef and barley, this belly-warming soup is just right for the winter months. Add some crusty bread and it's a meal! This vegetable stew will surprise you with its depth of flavor. We fire-roast garden-fresh tomatoes, then add more fresh vegetables and spices for a healthy, nutritious, delicious meal. Our chefs have created this fine medley from garden fresh ingredients and outdone themselves in creating a low-calorie yet still hearty dish. Vegetable Stew Delivered - what a great idea! If you're hungry for a real taste of New England then get ready to be impressed... because this authentic Clam Chowder delivers the traditional East Coast flavor you crave! Made with real cream and signature spices, this thick, chunky chowder is loaded with New-England caught sea clams, potatoes and onions. Quick to fix, this delicious chowder can be boiled in the bag or even microwaved. The whole family loves it, but White Chicken Chili used to require a cabinet full of ingredients... simplify with this all-included crazy-flavorful chili ready for your slow cooker. No chopping, prepping, sautéing, or mixing - all you need to do is start it in the morning and head out for your day! While you're gone, a warm, creamy broth of chicken stock and cream with garlic & spices will be slowly working its magic on premium chicken, white beans, sweet corn, green chiles, onions, and mild jalapeños. When you come back to the house hungry... your perfect meal awaits. This family-friendly (don't worry, it's not spicy!) classic Cuban dish is extra easy and a tasty way to grow your dinner menu, even on your most hectic days. It's all included - no shopping, no chopping, no stress, no mess. The traditional Cuban marinade and sauce is made with real citrus with garlic and oregano, surrounding melt-in-your-mouth Omaha Steaks pork and black beans. It's a global favorite that your family will love, even if its the first time you've tried it. Just put the ready-for-you ingredients in your slow cooker before you leave for the day... when you get home, just quickly steam the pre-cooked rice in minutes and serve in big bowls to your excited gang. People like to talk about where and when they've tasted great chili. The "where" can now be your place. Steakhouse Chili is hearty, tender, generous chunks of fully cooked sirloin and plenty of ground beef - flavored perfectly with chili, black beans and red, green and yellow peppers. It comes in bags you just boil, or heat in the microwave. When? Shortly after you place your order. Why not today? Do Not Thaw! Stove-Top: Bring enough water to a boil in a pot to submerge soup bag. Place bag of chili in water. Reduce heat to medium and let simmer 30 minutes. Remove bag with tongs and carefully cut open corner using scissors. Pour into serving bowl and serve. Microwave (1100-watt): Place unopened bag in microwave. Microwave on defrost for 6-8 minutes. Carefully cut open corner of bag and pour into a microwave safe dish. Microwave on high for 5 minutes. Stir well before serving or until internal temperature reaches 165�F. Stir well before serving.